It’s a testament to Coppola’s masterful filmmaking that in this scene, when Hollywood hotshot Jack Woltz wakes up in his bed with the severed head of his prized stallion, the horror is so invasive and so telling of the reach of Don Corleone that no one ever gives a second thought to how precisely that head might have gotten there. Well, most people don’t. Playwright Damon Lockwood and the crafty members of the Italian theater company Catttiva Compagnie, on the other hand, submit the zippy New York Fringe offering Horsehead as a possible explanation. We meet two lowlife brothers named Fillipo and Edmundo who have agreed to perform the gruesome equine decapitation and delivery. This is Phil and Ed’s big opportunity to get in good with “the family,” but at the last minute they start get cold feet about accepting the proverbial “offer they couldn’t refuse.” Horsehead won top honors at the Fringe Festival in Rome last year, and deservedly so – it’s a brisk, highly entertaining comedy that cleverly illuminates one of the more infamous scenes in cinema history. One of my favorite types of storytelling is something that I will call for these purposes a “supplemental narrative,” where a smaller story takes place within the context of a larger one. This manifests itself in a couple of forms, like Tom Stoppard’s absurdist play Rosencrantz and Guildenstern are Dead, which occurs parallel to the events of Hamlet, but instead follows Hamlet’s loopy college buddies; or something based on obscure historical research, like Mark St. Germain’s play Freud’s Last Session, which viably imagines an encounter between Sigmund Freud and C.S. Lewis. A supplemental work like this informs a larger body of work or historical event that we thought we understood, whether it’s Hamlet or the writings of Freud and Lewis, by showing them to us from a different or reduced perspective. Lockwood’s Horsehead brings a new perspective to The Godfather, and a damn funny one. 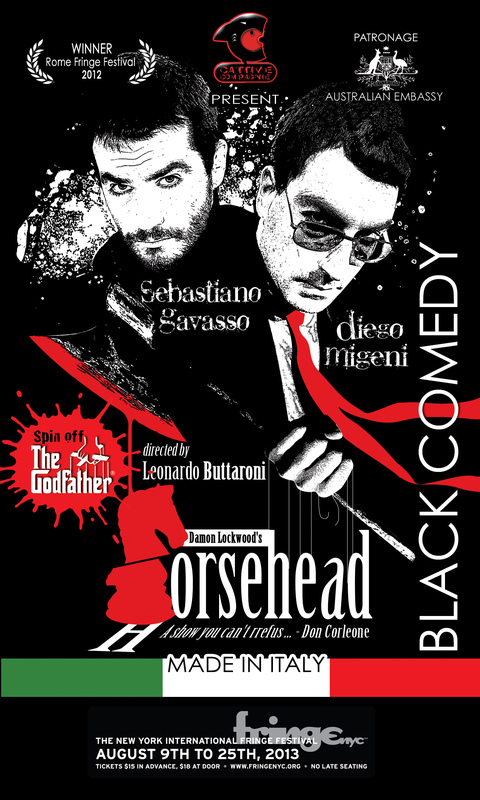 Most of this is attributable to Sebastiano Gavasso and Diego Migeni, who play Phil and Ed almost in fast forward – in a mere sixty minutes they fret, they posture, they argue viciously in bursts of unintelligible Italian, and they mull over the details (a real horse’s head or a fake one?) as though their shabby apartment was on fire. Lockwood gives them amusing layers to play as well – Phil loves horses more than anything, for instance, and the goofball Ed wants to be an actor. Can they really do such simultaneous harm to both a horse and the head of a major studio? Perhaps most refreshingly the cast, guided by steady-handed director Leonardo Buttaroni, infuses an authentically Italian sensibility to the piece, playing a little more for broad laughs than I imagine an American cast would. In researching The Godfather before reviewing this I learned something that serves as an interesting coda. Back in the 70’s, animal rights groups protested the inclusion of the horsehead scene in the film… because Coppola used an actual severed horsehead. Later he publically stated that the horse’s head was delivered to him by a dog food company and had not been killed specifically for the picture. Still – once upon a time, some version of the gruesome events of Horsehead probably did occur between a couple of dog food company employees, who similarly wondered what the consequences would be if they didn’t do what the “don” of modern cinema asked. Thanks Klock! And thanks for reading. You would have loved this show.